Khokhlovskaya Square, which was redesigned as part of the regeneration of Moscow’s historic Boulevard Ring. 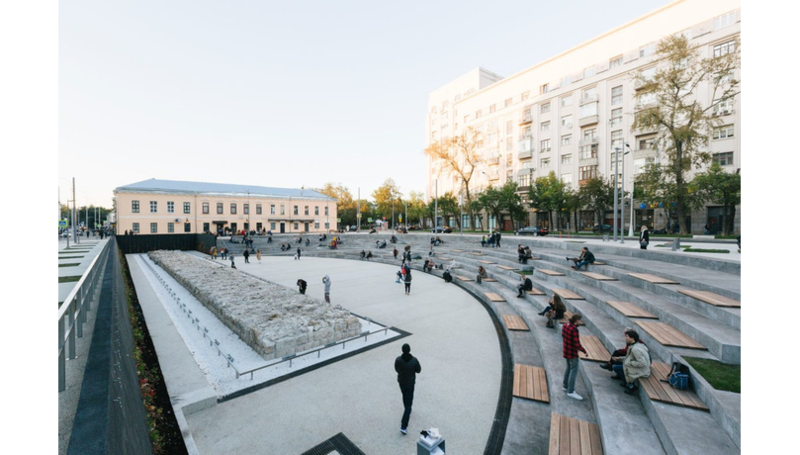 The design by Djao-Rakitine provides a new type of open space with the archaeological remains of the Belgorodskaya Wall. Join Strelka Institute at the Building Centre of 24 October for a discussion about public space in Russia. Until recently there was no commonly accepted term for ‘public space’ in Russia. Formerly, the idea of ‘the public’ came with the negative connotations of control and collectivism. But, liberated from these ideas, a new generation is beginning to see the public realm as a fluid concept that embraces digital space as much as the physical public space of cities. Ambitious regeneration programmes for urban spaces are transforming peoples’ perceptions of what it means to be public, and the My Street campaign in Moscow has already led to a 23 per cent increase in pedestrians. On the occasion of a Strelka research visit to the UK organised in partnership with British Council, Nicolay Boyadjiev, Design Tutor from the Strelka Institute in Moscow, will give an introduction to the ideas and design practice shaping public space across Russia. Starting with My Street, which began in Moscow in 2015 and is arguably the most radical urban transformation of the city since Stalin’s time, Boyadjiev will go on to outline plans for public spaces across Russia. Following the talk delegates from cities around Russia will join the panel to provide insights from cities as far afield as Vladivostock and Yatutsk. The event is a rare opportunity to hear about a programme that is set to change the physical landscape and culture of Moscow and many other Russian cities in the coming years. This event is in collaboration with the Strelka Institute and Building Centre.